The TCX Vibe WP Boots are all about happy thoughts, enjoyable rides, and good… well… vibes! 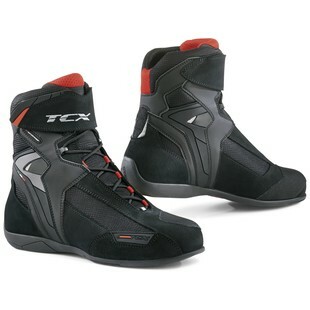 When looking at this pair of motorcycle footwear, it is difficult to see that TCX was enjoying the task at hand as well. What task was that you ask? Good question. To design a motorcycle boot that is equally as adept at handling the day-to-day commuting as it is with the long-range touring. In bringing together a durable sueded leather upper with waterproofing and an Air Tech interior, the TCX Vibe WP Boots are able to keep the wearability and weatherproofing features common for long-haul touring boots, while also retaining the type of efficiency of design that is desired by commuters. To augment these capabilities TCX also incorporated an anatomical and replaceable footbed, a speed lacing system with added reflectivity, and a padded upper collar. Additional features of the Vibe WP Boots include a bycast leather shifter pad, VELCRO brand fasteners, and PVC micro-injected ankle guards on both sides. At the end of the day, the last thing you should be thinking about in the saddle of your motorcycle is your footwear. If it is doing its job, it will be forgotten as you enjoy every last minute, twist, turn, and throttle pull as you go. The TCX Vibe WP Boots do precisely that.